G.N.O is straight up dance, clubbing music. A nice breathe of fresh air to get you dancing. I personally didn’t really think too much of the live versions of the song, but its a fun track especially as the first track on the album. I’m sure that everyone will agree that picking Be My Baby as the lead promotional track wasn’t the best decision. There are so many strong tracks; actually any other song could’ve easily been picked. ‘BMB’ isn’t that bad, but its the same old “retro” song and dance that they had for their last two concepts ( 2 Different Tears and Nobody). This was such a safe comeback, I would’ve enjoyed ‘Me,In’ eons more than this.I can understand that retro is now their signature style like Secret with the repetitiveness, but I know the fans would have equally been overjoyed with a new look and fresh sound. Girls Girls has that ‘Nothin’ on You’ sound from the cover they did on Billboard. If you haven’t heard that then click here. I love that this song has a really positive message about following your dreams, something that isn’t evident in a lot of pop songs or any songs for that matter. The song does have a familiar melody that I can’t really recall, just an R&B song, but I really like this song. Me, in is amazing. Can I say how much I adore this song? Everyone sounds amazing; it’s edgy and fresh. Props to JYP for picking a song that complimented their voices. I would love if they explored this “rough”, rocker sound. Sweet Dreams goes back into retroland with a sound very similar to 2 Different Tears, but more disco. Another dance song, but since I feel like I’ve already heard this , the song is okay. Stop! reminds me of this girl group from the ’90’s called Play. Does anyone remember them? Anyway, this song has that mysterious spy sound like what SNSD’s Hoot should’ve sounded. Dear. Boy is a simple R&B song; this sounds like an easier R&B like for the rest of the group who don’t have as strong singing voices. But I do enjoy this song especially Yoobin’s singing.두고두고 written by Ye Eun, this song is straight up R&B like kind of church-y.I like this song its a good listen, but its not my favorite R&B song. SuperB Oh snap! Euro dance is so evident in this song. I don’t really care too much for this song, it’s an okay listen.Act Cool (feat. San E) is the youngest members Hye Lim’s solo. I was all Team Lim when she first joined after Sunmi’s departure. This song is cute , but isn’t a song that you should have on heavy rotation. San E doesn’t really have an important part in the song save for a few ad-libs here and there. Basically this is for all the haters and it’s a cute way to let the naysayers know she’s not playing. Be My Baby (Ra.D Mix) is WAY better than the original. It fits the retro/modern sound way better and ends up sounding less Christmas-y. Nu Shoes is an all English song that finishes the album. It has a bouncy beat and is a fun song for fashionistas talking about their love of shoes. Great review! 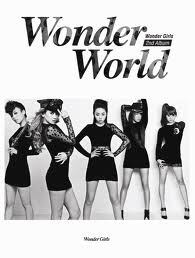 One of the best Wonder Girls albums (and of 2011) I have listened to. Apart from Girls Girls, Nu Shoes and Ra.D mix, I still enjoy the album.